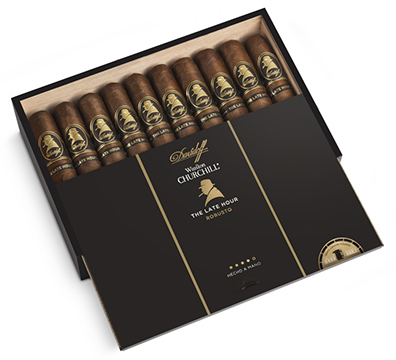 Named in honor of the man who found inspiration and creativity in the late hours of the night, Davidoff's Winston Churchill - The Late Hour cigars are blended with Nicaraguan Condega Visus filler tobacco aged for six months in the finest Scotch single malt whisky casks, which lends uniquely complex, deep, and sweet flavors to this equally inspiring and creative blend. The flawless, dark, and oily Habano Marron Oscuro wrapper from Ecuador blankets two Nicaraguan Visus filler tobaccos grown in Condega and Estelí together with Dominican San Vicente Mejorado Visus, Piloto Seco, and Olor Visus bound in dark San Andrés leaf from Mexico. The full-bodied Late Hour shares robust flavors with layers of black pepper, dark coffee, sweetness, old leather, wood and spiciness. Sir Winston Churchill once said, "Everyone has his day and some days last longer than others." When your long day ends, The Late Hour cigar is the perfect nightcap we might add.